The Netherlands is a low-lying country where the rivers, the IJsselmeer and the North Sea provide an abundance of water. The delta must protect itself against flooding and ensure a sufficient fresh-water supply. The Netherlands must also prepare itself for rising sea levels, soil subsidence and higher temperatures. The Delta Programme is designed to rise to these challenges. The knowledge issues from this Delta Programme return in the National Water and Climate Knowledge and Innovation Programme (abbreviated to NKWK in Dutch), which has been operational since 2015. The NKWK comprises of fourteen research tracks, in which government authorities, knowledge institutes and companies collaborate on pilot projects, topical issues and long-term developments. The NKWK serves as the Dutch Wing of the Delta Alliance. 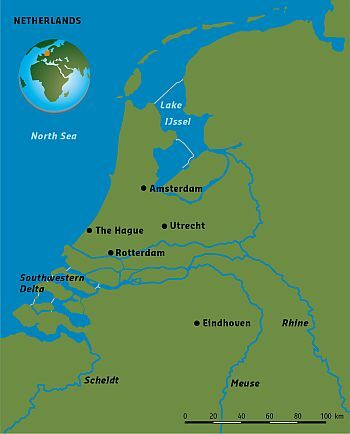 The Netherlands is a river delta. In the past the rivers flowed to the sea without restraint. Today they are largely contained by groynes and dykes. The current rivers area consists of the river basins of the Meuse, IJssel, Scheldt and Rhine. In the west there is a densely populated coastal zone that is home to the Randstad conurbation – the economic heart of the Netherlands. It has a population of 9 million people and accounts for 70 percent of the total income earned. 5 years of buidling with nature: Every year, the sea takes sand from the Dutch coast. Every five years, Rijkswaterstaat replenishes the shortfall by depositing sand on the beaches and in the offshore area. If we didn't, the west of the Netherlands, which is below sea level, would be exposed to the sea. The sand replenishment operations every five years do the job, but can we protect the coast in more sustainable and natural ways? Natuurmonumenten (Dutch Society for Nature Conservation) is going to restore one of the largest freshwater lakes in western Europe by constructing islands, marshes and mud flats from the sediments that have accumulated in the lake in recent decades. These 'Marker Wadden' will form a unique ecosystem that will boost biodiversity in the Netherlands. Blue Energy stands for the generation of power from the difference in salt concentration of salt and fresh water. A test set-up is currently operating in Breezanddijk (Afsluitdijk), which we are using to gain knowledge about this new method for power generation. The power station uses water from the Wadden Sea and the IJsselmeer. If the tests are successful, we may upscale the project to create a demonstration installation. When completed in 2017/2018, Tidal Technology Center at the Grevelingendam (TTC-GD) will provide owners of new technologies in tidal energy with the means to test, certify and showcase their products in fully operational tidal context. It will also provide a demonstration setup of 4 turbines capable of producing 0.5 – 1.0 MWe of energy. The I-STORM network brings together professionals that build, manage, operate and maintain Storm Surge Barriers. I-STORM aims to continuously improve standards of operation, management and performance in order to reduce the risk of severe flooding of people, property and places around the world, by facilitating knowledge exchange amongst members. Several of the world's largest deltas have recently been conceptualized as social-ecological delta systems. Although such conceptualizations are valuable in emphasizing complex interaction between social actors and ecological processes in deltas, they do not go into specific dynamics that surround technological developments in the hydraulic domain. By drawing from concepts originating in socio-technical systems research, we stress the importance of technology, particularly the domain of hydraulic engineering, in shaping a delta’s future. Delta Alliance electronic board room session. The Rhine-Meuse delta, the Netherlands , Cees van de Guchte & Bart Makaske, Deltares & Alterra, the Netherlands (2010). Presented at the international conference Deltas in Times of Climate Change, 29 September - 1 October, Rotterdam, the Netherlands. Watch the Knowledge for Climate Research Programme Videos related to the Dutch Delta on the Youtube channel (English subtitles).